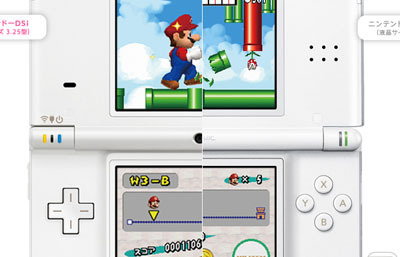 A new DS is revealed, upgrade of the DSlite. 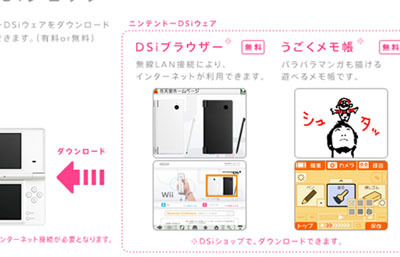 The new DSi (yes, DSi, not iDS) is coming soon in 2009, hit in Japan first, then the US and finally Europe. 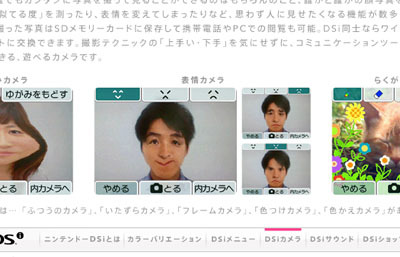 The Official Site is now up explaining the features, upgrades for the new DSi. (Site is in Japanese). 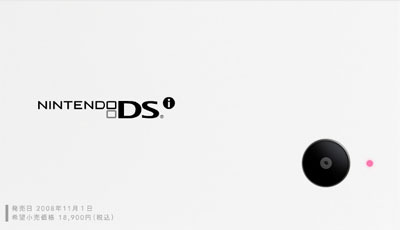 So whats new about the new DSi? 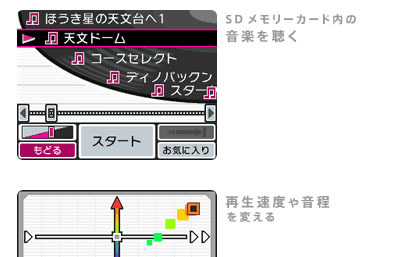 The DSiMenu is a side scrolling icon menu on the lower screen (simple version of the PSP menu). 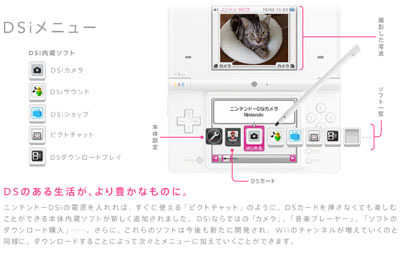 In the menu you can access the Setup, Game, DSiCamera, DSiSound, DSiShop, Pictochat, and Downloadplay. Having heard that the camera is 0.3MP, I’m quite depressed about it. They’re should of giving it a better quality camera for the DSi. Take pictures and saves into the SD memory card. The DSi also lets you play around with the photos you’ve snapped. This includes smudging the photos, much like Photoshop’s smudge tool. Smudging also comes with preset smudge effects (3 face presets >_> ). Other things to do with the photos is that you can decorate it with flowers and grass, or overlap 2 photos transparent effect by putting the photo’s together of some sort. I’m not entirely clear of the other features in Camera mode. Play music from the SD memory card, AAC format of some sort. It has a nice menu for scrolling through your music list too. Other things that the DSiSound does is probably record audio from the Mic and allow play back. Volume controls and other features like mini-games. 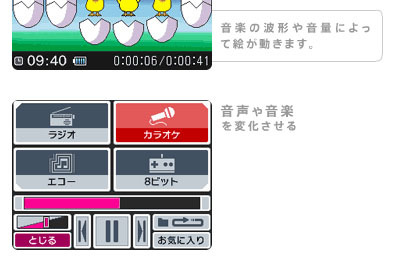 A menu that shows ‘Radio’, ‘Karaoke’, ‘8Bit’, ‘エコー’, ‘インコ’, ‘Trumpet’ and 2 others that I couldn’t make out. There is a colourful bar menu which I don’t know what it does, I have no Japanese reading ability.<KO-SUSEREKUTO> Course Select? I take that the ‘Trumpet’ allow you to blow into the Mic to play some …Trumpet sounds. Radio, tune into the closest FM station I suppose and the rest is an mystery. I hope its called DSiShop, from the look of the spelling it looks like DSiShop. Lan to the Wii or something to download extra tid-bits I suppose. “DSiSHOPPU de, DAUNRO-DO de kimasu.” Yay for downloads!? 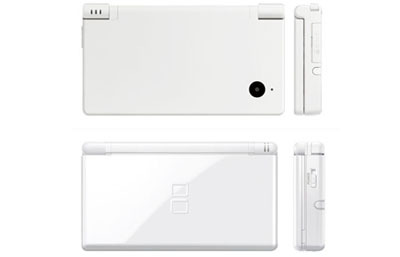 The price for the DSi is 18, 900yens, which is from £100/$180. But thats just a conversion. Actual prices differ (it would cost more -__- probably something like £140/$200).